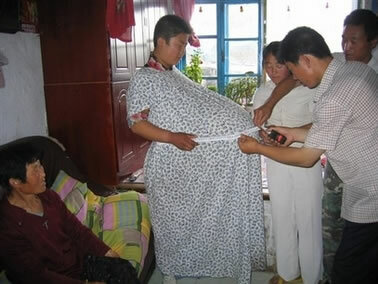 A Chinese woman has admitted she faked being pregnant with quintuplets to please her husband. Qiao Yubo, 23, of Songyuan city, Jilin province, became quite a star in the Chinese media for her pregnancy. But she was exposed as a fake when a doctor called at her home to do a check-up and she ran away, reports Xinhua News. “The pregnant mom jumped from a window and ran away,” says Mr Li, president of Changchun Puji Hospital. 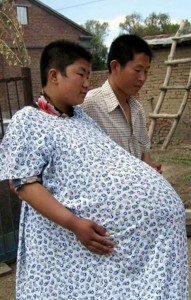 Qiao later admitted she had stuffed clothes under her dress to fake her pregnancy to please her husband, Liu Defu, who had been in a car crash. She was originally pregnant with twins but miscarried them after falling. She didn’t tell her husband because he had his leg fractured in a car accident. He knew she was having twins, but just assumed that there were more in there. Liu has now forgiven his wife: “She was taking care of me when I was injured, and she didn’t want me to get hurt again by learning about the miscarriage,” he said. Who fakes being pregnant with quints? One maybe… but not 5. Some people are ridiculous! Yeah, maybe with one baby but 5 is completely ridiculous! Why would you even WANT to fake being that huge?